An Atlas V 421 rocket launched the Morelos-3 mission for Mexico’s Secretaria de Comunicaciones y Transportes (Ministry of Communications and Transportation) on Oct. 2, 2015, from Cape Canaveral Air Force Station, Florida. 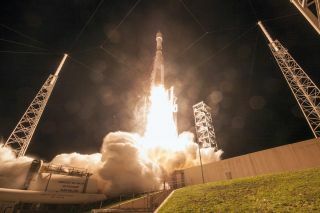 The Atlas V rocket launched from Florida's Cape Canaveral Air Force Station at 6:28 a.m. EDT (1028 GMT) today, carrying the Morelos-3 satellite for Mexico's Ministry of Communications and Transportation. Morelos-3 is joining the Mexsat satellite constellation, which helps serve Mexico's national security needs and provides communications to rural zones, ULA representatives said. ULA currently operates the Atlas V, Delta IV, Delta IV Heavy and Delta II rockets, which have rich heritages that stretch back more than half a century. For example, the first flights of the Delta rocket family took place in 1960, and in February 1962, an Atlas LV-3B booster launched John Glenn on the United States' first crewed orbital flight. ULA launches payloads for many organizations, though the U.S. Department of Defense and NASA are notable repeat customers. In December 2014, for instance, a Delta IV Heavy rocket launched NASA's Orion capsule on the spacecraft's first test flight, an uncrewed mission called Exploration Flight Test 1. And Atlas V rockets lofted the agency's Solar Dynamics Observatory (in 2010), Juno Jupiter probe (2011), Mars rover Curiosity (2011) and MAVEN (Mars Atmosphere and Volatile Evolution) Mars orbiter (2013), among others. ULA is also developing a partially reusable rocket called Vulcan, which company representatives hope will eventually replace the Delta and Atlas rockets. Vulcan could begin flying by 2019. Next up on ULA's manifest is the NROL-55 mission for the U.S. National Reconnaissance Office (NRO). An Atlas V will launch the NROL-55 satellite, along with 13 tiny cubesats (four from NASA and nine from the NRO), from California's Vandenberg Air Force Base on Oct. 8.